Famed, largely untouristed temple in Banteay Meanchey province near the Thai border. Banteay Chhmar is a largely unrestored, sprawling monastic complex set amongst jungle overgrowth. Face towers, temple in jungle scenes and extensive, amazingly well preserved bas-reliefs provide some of the highlights. Banteay Chhmar was dedicated to the son of the King, Jayavarman VII, who died fighting Champa. 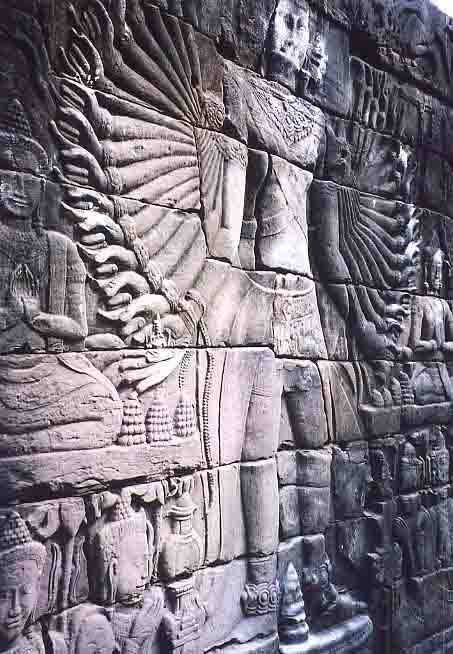 Khmer-Cham battles are depicted in the bas reliefs. Located about 70km north of Sisophon Town which seves as the gateway to Banteay Chhmar, requiring an entire day to get to and back from Siem Reap. Somewhat more easily approached from Battambang.